Charles B. “Chuck” Morton Jr. When Mike Satz took over as Broward State Attorney in 1976, Chuck Morton was his very first Assistant State Attorney appointment. “To this day, I still consider it one of the best decisions I ever made,” Satz says. He calls Morton “a true criminal-law professional who has distinguished himself … both in and out of the courtroom.” In 2005, Satz promoted Morton to Chief Assistant State Attorney. In his 37 years as a prosecutor in Florida’s second most populous county, Morton handled over 400 jury trials and over 40 first degree murder cases. In 2000, he was named “Prosecutor of the Year” by the Broward County Crime Commission. Morton retired with an untarnished reputation and the respect — even the affection — of his peers. He is a charming, easy-going man … genuine, caring and unassuming. He radiates warmth and kindness. When he takes a stand for justice, however, Morton stands firm. During the headline-grabbing Lionel Tate case, the Rev. Al Sharpton and O.J. Simpson attorney Johnnie Cochran came to town. Tate had murdered a 6-year-old playmate when he was just 12. He was sentenced to life. Sharpton and Cochran were concerned that the prosecution of Tate was racially motivated. In separate meetings, Morton explained the case, showed them the grisly photos … and they both left quietly. In another high-profile murder case, Morton thought a conviction was unlikely. Despite the harsh glare of publicity, he declined to prosecute. He endured a wave of criticism, but did what he thought was right. “America’s Most Wanted” host John Walsh singled Morton out for praise in 2008 — saluting him for “never giving up” in the search for the killer of Walsh’s 6-year-old son, Adam. Florida Gov. Jeb Bush appointed Morton to chair his Task Force on Capital Cases, and the Florida Supreme Court named Morton to its “Racial and Ethnic Bias Study Commission.” Florida Bar President Eugene Pettis recently named Morton to the prestigious “Vision 2016 Commission,” which will conduct a three- year comprehensive study to determine how the Bar needs to adapt and advance to meet the needs of the modern marketplace. It will focus on technology, legal education, Bar admissions and delivery of pro bono legal services. Morton earned a B.A. at Rollins College in 1972 and a law degree from the University of Florida in 1975. The career that resulted was not limited to criminal prosecution. Morton went to work as a staff attorney for Legal Aid, then joined the law firm of Selig Goldin’s friend, W. George Allen — the first African-American to graduate from a predominately white college in the South. 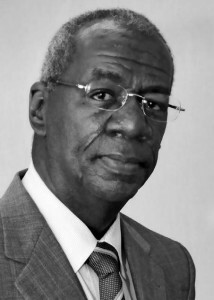 In 1970, lawyer Allen successfully took the battle for Broward school desegregation to the U.S. Supreme Court. Goldin was Allen’s mentor at the University of Florida. Allen says Goldin “would be proud” that a man with Morton’s “education, dedication, and accomplishments” would get the Goldin Award. Morton brings his experience, knowledge and high ethical standards to a new generation as an adjunct law professor at Nova Southeastern University School of Law. He has been teaching trial advocacy skills there for years. He also helps run the law school’s Criminal Justice Clinic. In 2008, Nova honored Morton as its first “Adjunct Professor of the Year in Lawyering Skills Courses.” His teaching work at Nova and elsewhere also resulted in a 2010 “Lifetime Achievement Award in Legal Education” from the Florida Prosecuting Attorneys Association. Morton has also been a frequent faculty member of the Criminal Law Section’s annual Prosecutor/Public Defender trial training program held at the University of Florida. Despite his retirement, Morton continues to maintain an active interest and involvement in numerous community and charitable organizations. 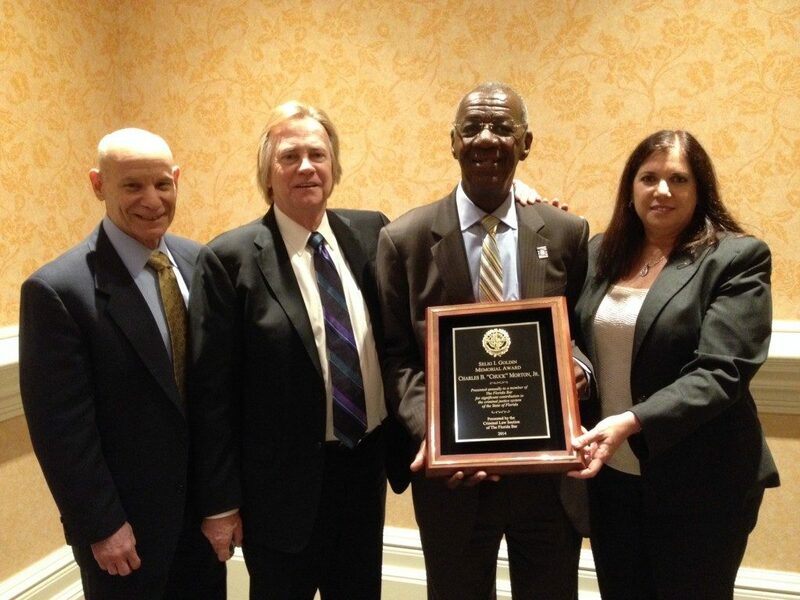 2014 Selig Goldin Award Presentation to Charles B. Morton, Jr.
Susan O. Hugentugler, Chair of the Criminal Law Section.